Russian lunar orbiter. The E-6LS was a radio-equipped version of the E-6 used to test tracking and communications networks for the Soviet manned lunar program. Lunar lander, Russia. Launched 1967 - 1968. AKA: E-6LS. Status: Operational 1967. First Launch: 1967-05-16. Last Launch: 1968-04-07. Number: 3 . Gross mass: 1,700 kg (3,700 lb). 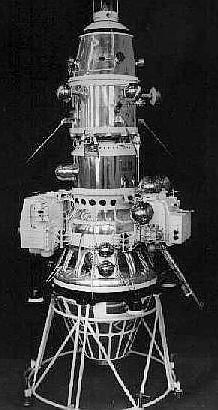 Otherwise the spacecraft instrumentation was similar to that of the E-6LF and provided data for studies of the interaction of the earth and lunar masses, the lunar gravitational field, the propagation and stability of radio communications to the spacecraft at different orbital positions, solar charged particles and cosmic rays, and the motion of the Moon. Family: Lunar Orbiters, Moon. Country: Russia. Engines: KTDU-5A. Launch Vehicles: R-7, Molniya 8K78M. Projects: Lunar L1, Lunar L3. Launch Sites: Baikonur, Baikonur LC1. Agency: Korolev bureau, MOM. Bibliography: 2, 296, 6, 64, 65, 12775. 1967 May 16 - . 21:43 GMT - . Launch Site: Baikonur. Launch Complex: Baikonur LC1. LV Family: R-7. Launch Vehicle: Molniya 8K78M. Cosmos 159 - . Payload: E-6LS s/n 111. Mass: 4,490 kg (9,890 lb). Nation: Russia. Agency: MOM. Program: Lunar L1. Class: Moon. Type: Lunar probe. Flight: Soyuz 7K-L1 mission 1. Spacecraft Bus: Luna E-6. Spacecraft: Luna E-6LS. Decay Date: 1977-11-11 . USAF Sat Cat: 2805 . COSPAR: 1967-046A. Apogee: 60,637 km (37,678 mi). Perigee: 350 km (210 mi). Inclination: 51.60 deg. Period: 1,174.20 min. The E-6LS was a radio-equipped version of the E-6 used to test tracking and communications networks for the Soviet manned lunar program. The payload entered the desired orbit as Kosmos-159..
1968 February 7 - . 10:43 GMT - . Launch Site: Baikonur. Launch Complex: Baikonur LC1. LV Family: R-7. Launch Vehicle: Molniya 8K78M. FAILURE: At T+524.6 sec Stage 3's engine 11D55 cut off prematurely because it ran out of fuel due to an excessive fuel consumption rate through the gas-generator.. Failed Stage: U.
E-6LS s/n 112 - . Payload: E-6LS s/n 112. Mass: 1,700 kg (3,700 lb). Nation: Russia. Agency: RVSN. Program: Lunar L1. Class: Moon. Type: Lunar probe. Flight: Soyuz 7K-L1 mission 1. Spacecraft Bus: Luna E-6. Spacecraft: Luna E-6LS. Decay Date: 1968-02-07 . 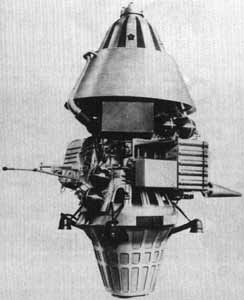 Failed launch of an E-6LS radio-equipped version of the E-6 used to test tracking and communications networks for the Soviet manned lunar program. Suggestions for the abnormal consumption included the seizing up of a pintle valve for controlling fuel supply into the regulator or the seizing up of the fuel inlet control. The upper stages broke up in the atmosphere.